Tampa unveils 10 charging stations for electric cars with NovaCharge partner AA&I Electric! TAMPA — A version of the future arrived today. At eight city parking lots, 10 charging stations for electric cars sparked to life, marking the first time in Tampa’s history that such futuristic innovations were plunked down amid parking meters and pay stations. It’s only the beginning, city officials and industry captains vowed. Today, 10 stations. Tomorrow … who knows? He admitted later that the electric car industry is in a conundrum. People are hesitant to buy electric cars because of a lack of charging stations and there’s only a few working charging stations, which cost $8,000 each, because of the dearth of electric cars on the road. Industry speculators are hoping that will change. She said the hope is to have 150 charging stations in and around the city by the end of the year. Thanks to a $15 million U.S. Department of Energy grant, there is no cost to the city. 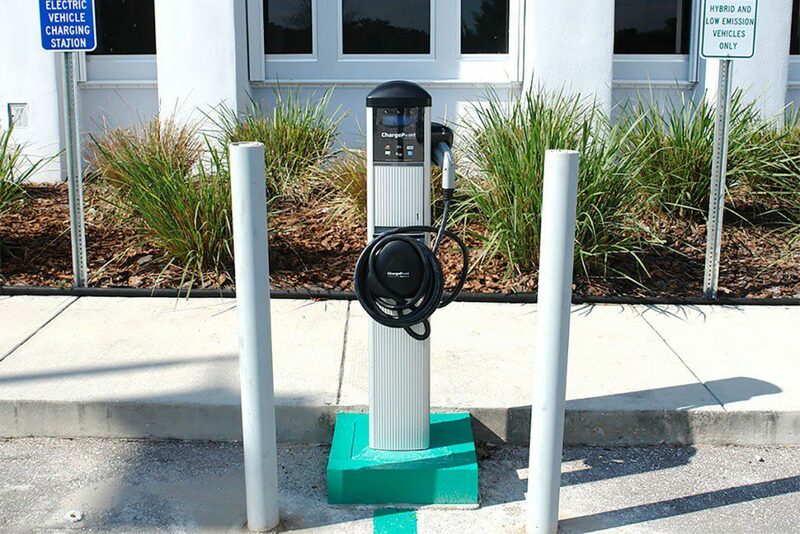 Under the program, Tampa became one of seven cities across the nation installing the charging stations in public parking lots and monitoring their usage over the next two years. Tampa won’t charge a service fee for use of the charging stations, but, motorists will have to pay the normal parking fee in the public lots. Each charging station can power-up all types of electric vehicles from cars to scooters to Segways; even electric bicycles, Rodriguez said. Ultimately, she said, the hope is that the industry will reduce carbon emissions from gasoline powered vehicles and create jobs in the Tampa Bay area. Richard Nimphie, owner of Suncoast Electric Vehicles in St. Petersburg, said that his dealership has sold eight Wheegos electric cars and has orders for several more. He said the total number of fully electric vehicles in the Tampa Bay area likely is fewer than 100. Among the concerns of consumers is the lack of charging stations, he said. “Range anxiety,” he said. “They’re asking, ‘How far can I go on a charge? '” But most people who would use an electric car to commute to work wouldn’t need to worry, he said. Cars can go around 100 or more miles on a charge, he said, and 70 percent of working people only drive 15 to 20 miles to work. “Most people live close enough to where they work that they can charge their cars at their homes overnight,” he said. He said Hillsborough Community College just took delivery of an electric van and his sales staff is constantly making proposals to municipalities across the state to sell them electric fleet cars. Tampa’s fleet of vehicles has no fully electric cars, but does include some hybrids, said Irvin Lee, director of Tampa’s public works department. The city gets vehicles through a bid process and manufacturers are welcome to offer up their electric models. But they just aren’t cheap enough to win bids, Lee said. “We put out the specs and if Chevy wants to bid a Volt, I’m sure they could or would,” he said, “but it’s not going to be at a cost we’re looking for.” A new Volt costs about $32,000. Hillsborough County commissioners in June voted to install 10 charging stations around the county. Some went into parking lots of four libraries, a downtown parking garage and at the county’s Environmental Protection Commission headquarters. Charging stations also were expected on the Dale Mabry campus of Hillsborough Community College and at the St. Pete Times Forum. https://www.novacharge.net/wp-content/uploads/2015/08/tampa-charging.jpg 800 1200 byteplate https://www.novacharge.net/wp-content/uploads/2015/07/logo-novacharge-space.png byteplate2011-10-12 21:59:582015-08-25 22:11:17Tampa unveils 10 charging stations for electric cars with NovaCharge partner AA&I Electric! Federal Alternative Fuel Infrastructure Tax Credit is back!